The doors of Prolight + Sound are now open at the Messe Frankfurt and for the first time Panasonic is exhibiting with a large presence in Hall 9 on stand A30. 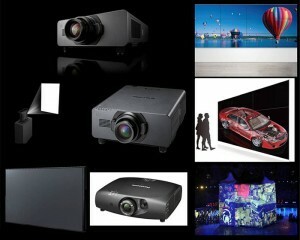 Panasonic is presenting a host of new display and projector innovations which answer specifically needs of the exhibition rental market and professional staging and events specialists. As a leading international event for technology and services for installation, events and production Prolight + Sound is a key meeting place for delegates and attendees from around the world and is an ideal platform for Panasonic to present its latest staging and rental AV solutions. Visitors to the Panasonic stand will be able to meet Panasonic technical experts who will demonstrate applications, discuss solutions and answer questions. Other new display solutions that will be showcased include new Large LCD displays such as the 80 inch TH-80LF50 which will be demonstrated in portrait mode orientation and will feature a protective shell solution which makes it more suitable for location in unmanaged areas or even hostile locations such as at outdoor events and exhibitions. On the Panasonic stand information is also be readily available about other display solutions for staging and rental, including the 70 inch TH-70LF50; 42 inch TH-42LF5 and 47 inch TH-47LF5 displays which all feature utmost attention to design detail, narrow bezels and Full-HD 1080p image reproduction. Event hire organisations seeking compact projectors with flexible installation, maintenance free operation and that offer excellent return on investment should check out the PT-RZ470/RZ370 series also being shown at Prolight + Sound. These lamp-free, LED/Laser-combined 1-chip DLP projectors provide 20,000 hours of life and offer a Digital Link connection based on HDBaseT technology. Panasonic also shifts its 1-Chip DLP projectors into the 10,000 lumens brightness arena with the introduction of the DZ870 range. With unparalleled picture quality and Digital Link connectivity, the series presents a perfect affordable tool for new and creative applications in stage shows and elsewhere within the theatrical and events setting. New additions to the Panasonic high brightness projector range for the rental and staging market are being exhibited including the recently launched PT-DZ13K Series. This range of three Chip-DLP projectors features multi resolution support, brightness of up to 12,000 lumens and features that deliver trademark Panasonic reliability. The PT-DZ13K series compliments the already world famous PT-DZ21K 20,000 lumens projectors which not only played a major role at the London 2012 Olympic Games but was also recently used in an interesting application to colour the Brandenburg Gate. Customers that want to discover the new visual innovations and discuss solutions with members of the Panasonic team are warmly invited to visit the Panasonic Prolight + Sound stand located at Hall 9 Stand A30.